I have been really busy lately, and neglecting my blog! 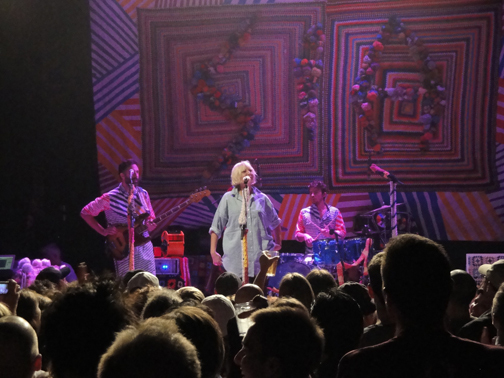 The fun part was seeing Sia at the Gothic, a small venue in Denver. She was very gracious & funny, as well as having an amazing voice. The grindstone part is I helped fire a kiln last week, with 2 firing buddies at the guild. It was an easy (!) 12 hour firing that turned out nicely. 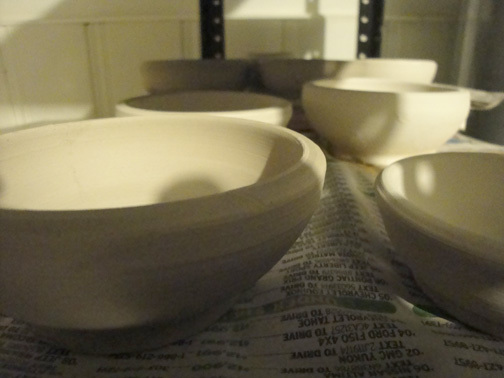 I managed to throw about 40 pots, mostly olive pit dishes, and small salt bowls. I’ve been searching the internet for some salt spoons. I think I found 2 different sources. Last time I made salt bowls, I also made salt spoons. They are hard to fire with glaze on them. The colors don’t always match either. So, I’m hoping the postman brings good news! I’ve also been working hard, gearing up for a small jewelry show at Barbara & Co here in Denver. I will be featured with 2 other local jewelry designers. Stop in there & look at some of the new things I just finished. I will try & photograph the pieces before they go into the show. I set 3 different large pearls, and I love them! Completion achieved! I finished this piece, after oxidizing it and adding some touches of 24k gold. It was a major process, and used almost a complete package of PMC+, 45 grams. My calculations were almost exact, not quite as planned, but close enough. The stone fits snugly in the opening. I may alter future designs, in that, it was very hard making the opening exactly fit to the stone, and seeing that this stone is odd shaped, well, difficult! Just returned from a weekend workshop with Hadar Jacobson. We worked with her Quick Fire Copper Clay and Quick Fire Bronze Clay. She has also introduced a steel clay. The product comes in powder form, add distilled water & work with it. It fires in an hour! Maybe I won’t need the solar panels after all. I made a few mixed copper & bronze pieces, and also made a copper piece that I torched fired silver metal clay onto, (PMC3). We had an extensive tool list, and used our rotary tools quite a bit. It was an fun group of creative women! 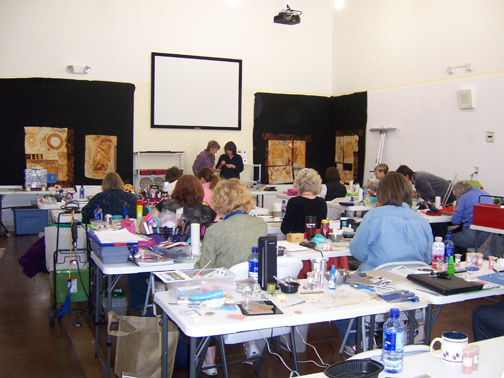 Thanks again to the Western Colorado Metal Clay Artisans for working hard to bring Hadar in for this amazing workshop! 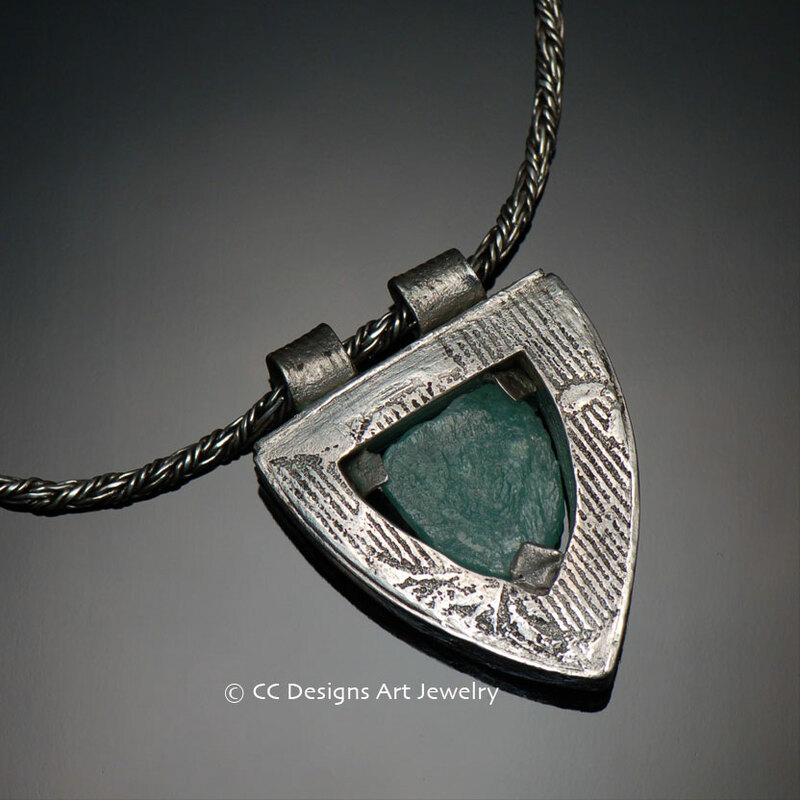 I’m working on a new silver metal clay piece. All the parts of the design puzzle must come together to get this stone to fit within the frame I am creating. I scanned the stone & made an enlarged photo of it to use as a template. The template became the focal piece to design the frame around. The frame is coming together, as it’s the first time I’ve done a somewhat hollow construction. I measured the depth of the stone and hopefully, with my handy ancient proportion wheel, I have determined that shrinkage as well. 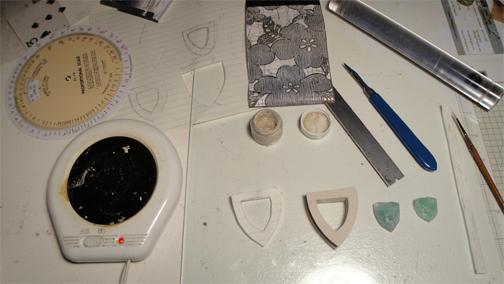 From sketch, to templates, to molding the clay, to construction, soon we’ll see a finished piece of art jewelry. Okay, I’ve been cooking & feasting instead of blogging! We had a big Easter Eve celebration with friends. And we had leftovers to make a second great meal. 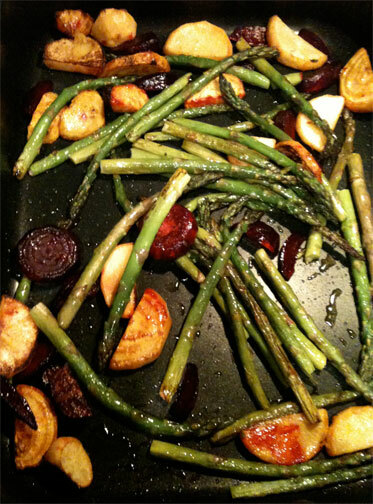 Risotto with ginger, & sweet potatoes, roasted cornish game hens, roasted beets, red & yellow, turnips, and asparagus. Great carrot cake. The blessings of friends. I’ve had my hands back in the earthenware clay, throwing for the upcoming Colorado Potters sale & show. Makes for dry skin! A suggestion from a friend, calendula helps, my hands feel young again. More to come….